To use basic machinings in different application options, you must first combine them into groups. You can get to the machining groups form through “CNC database” and ” CNC Groups”. This list shows you the machining groups that have already been created. To change an existing group, select it and confirm with “OK”. Enter a new group by clicking “Add”. Enter the name and the subname of the group, define the series in which this group can be used and finally select the type of the new group. It is only necessary to specify a subname if you want to create a given group more than once. This is practical, for example, when the same striking plate leads to different machinings depending on whether it will be used on a finished frame or a normal frame with an adaptor. The subname is used to distinguish between different groups with the same name when making changes. 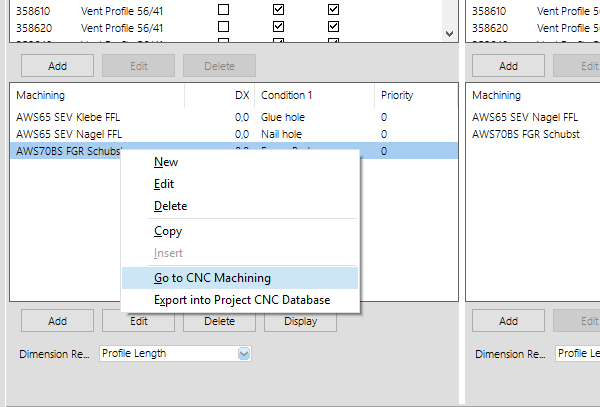 For later selection in hardware macros, technical profile data or element entry, you don’t need to know the subname; you simply select the name of the group and the programme checks one after the other until it finds a group in which the profile entered matches the one in the current item. If they match, that group is used. In the profile lists, enter the profiles on which the desired machinings can be carried out. Enter the machinings into the machining lists. In DX, you can enter one offset each. The conditions have a different meaning depending on the machining type. Please note that the macro is only used if the profile assignments match the actual conditions in the item entered. 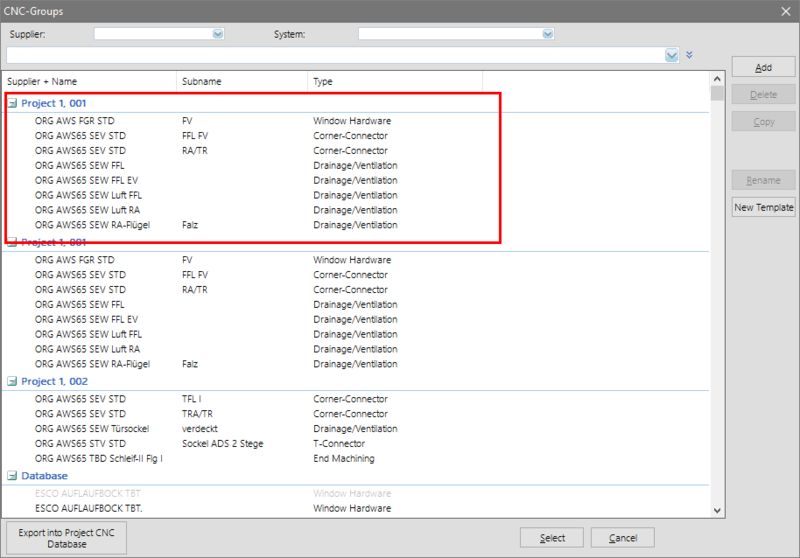 The only exception is the following: If no profile at all is entered from one side (“Frame assignments” or “Leaf assignments”), then it doesn’t matter which profile is selected there. On this side, then, no more machinings can be entered. The adjustment of project CNC machinings is now easier. LogiKal remembers the machinings of the recent edited position. Create a position with machinings and complete this in the Input of Element. The machinings used for your position are now shown at the top of the program window. To modify the machinings of a positio, double-click on the group. You can edit the machinings directly from this CNC Group and promptly return to the group screen. Click on a machining with the right mouse button and select the option “Go to CNC machining” from the context menu.